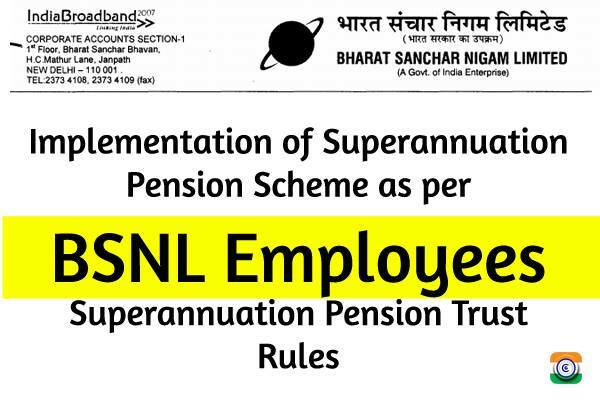 Sub: Implementation of Superannuation Pension Scheme as per BSNL Employees Superannuation Pension Trust Rules. As a measure of extension to social security to the BSNL recruited employees (as defined in BSNL Employees Superannuation Pension Trust Rules), BSNL has approved the implementation of Superannuation Pension Scheme w.e.f. 05.05.2016. Accordingly, BSNL has framed BSNL Employees Superannuation Pension Fund Trust Rules (copy of the Trust Rules is enclosed ). As per the Trust Rules, BSNL will contribute at the rate of 3% of Basic Pay plus IDA per month for all BSNL recruited employees, as defined in the Trust Rules. The employees may also contribute to the scheme on a voluntary basis. The quantum of employees' contribution to the scheme is governed by the Trust Rules. 1 There are two GL codes in respect of superannuation pension scheme. 2 Initially, on the basis of the process run in SAP, the total amount booked under Liability GL Code-1310203 upto September 2017, will be paid to the fund manager Corporate Office. GL Code 5010310 will be debited for the Employer Share. GL Code 1310203 will be credited by the amount of Employer share and Employee Share of superannuation pension scheme. 4 After completion of the salary process, total of the monthly credit under GL Code 1310203 duly tallied with the schedules, shall -be transferred to the Superannuation Trust on 5th of the following month followed by transfer of the equal amount to the fund manager by the Trust at Corporate Office level. Circles should reconcile the amount booked in GL code 1310203 with the HCM schedules by 4th of the following month. 5 At the time of maturity of the scheme on account of superannuation / retirement / resignation / death of the employee, the employees / nominee of the employees will be required to opt for the pension option offered by LIC as also annexed With this circular. To opt for the pension options, employees / nominee of the employees shall submit the requisite forms duly filled to the DDO/AO(Cash). 6 Circles should ensure to " revise the terms and conditions of deputation services to this effect and arrange to communicate with such other organizations. 7 The SAP related operational guidelines have already been issued by ERP HCM team. In the beginning, the DDOs will ensure to get the amount of monthly voluntary contribution and duly filled Nomination Form (copy enclosed) from the employees. At the time of maturity of the scheme on account of superannuation/ retirement/ resignation / death of the employee, the DDOs/AO(Cash) will ensure to send the claim form to GM(CA), CO, BSNL in original. Separate set of forms to be sent to this office for death and other than death cases are enclosed as Annexure 'A' and 'B' respectively. Each page of the claim form should be authenticated by the DDO/AO(Cash). LIC, the fund manager, of the BSNL Employees Superannuation Pension Scheme will provide the facility of online Web portal for each Employee through which the employees will be able to have updated. information on his superannuation pension contribution fund. The procedure to check the portal will be intimated in due course.